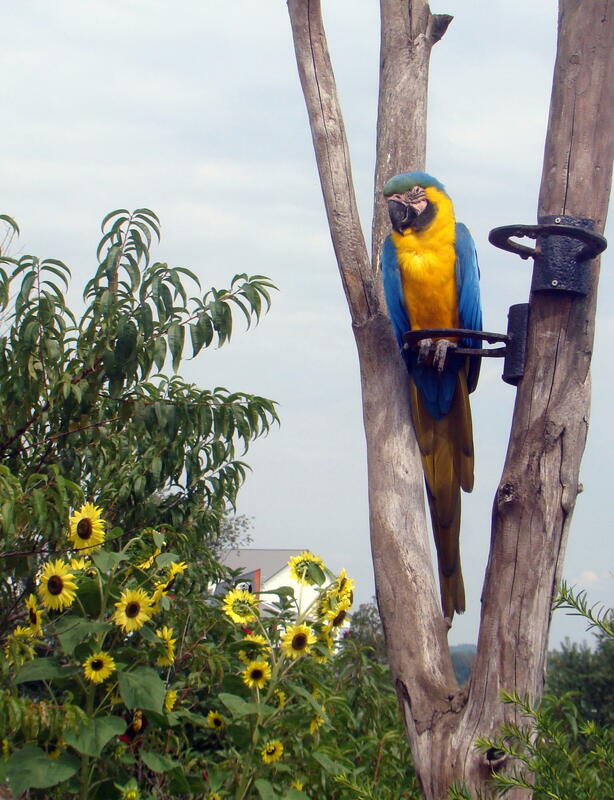 Colorful Macaw watches over activities. Did you ever want something to eat out of the palm of your hand? 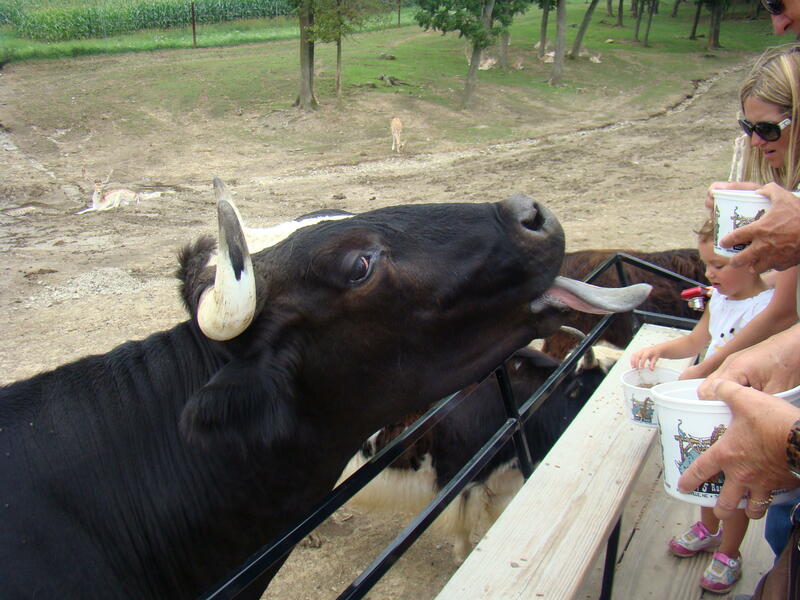 Visit The Farm at Walnut Creek where many animals rush for the feed in your extended palm.. This beautiful Amish farm, set in the rolling hills of Holmes County, makes a great place to spend the day. Everything here moves at a much slower pace – even farm work. This is definitely a working farm where you can see various chores being done, depending on the season of the year: plowing, thrashing, canning or quilting to name a few. Tour inside an authentic, non-electric, Amish farmhouse where you might be lucky enough to get a freshly baked cookie. Check out several barns, observe a blacksmith at work in his shop, and admire their beautiful flower gardens. A covered bridge creates a perfect setting for relaxation at a small pond surrounded by plants and flowers. Luke and mother, Libery, in the Giraffe Pen. But children and the young at heart come mainly to feed the farm’s 500 animals from six different continents. While everyone expects to see sheep, goats and cattle, a surprised look crosses their face when a Dromedary camel, giraffe or Grevy zebra appears. Two options exist for viewing the animals: by car or on a horse-drawn wagon pulled by beautiful Percheron draft horses. Try both for the best experience. By car, feeding seems a little safer since you can gently put up the car window if they try to stick their head inside the car…and they definitely will! Speed limit for cars is 5 mph to protect animals and passengers. The most fun of the day occurs on the hour-long wagon ride where each person is given a filled feed bucket for the animals. At least three horse-drawn wagons headed out each hour…and this visit happened on a Monday. The driver tells stories about the animals, as the horses trot slowly down the lane. Stops to watch the zebras and giraffes top the tour. Everyone has to be careful of the zebras as they might bite, so pour their food onto the ground. Mother zebra keeps a close eye on her two-week old colt. 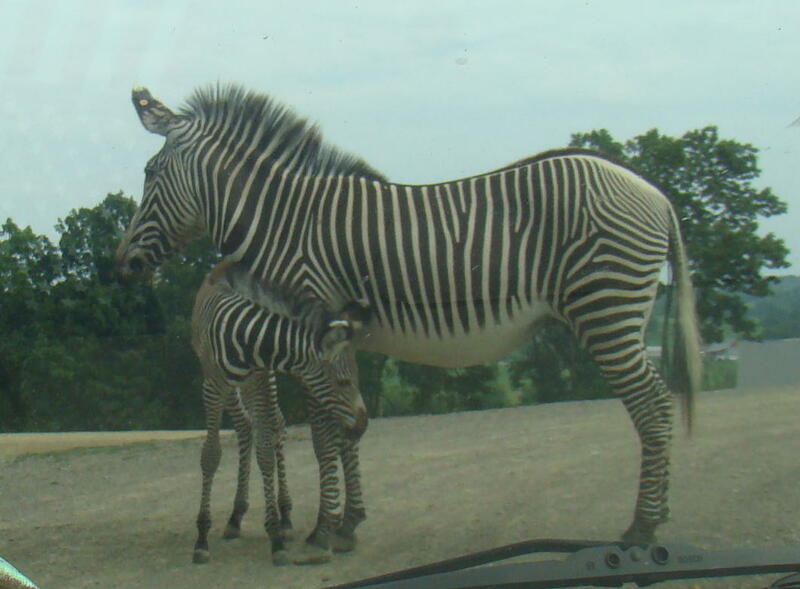 The picture of this zebra pair was taken through my windshield on the car tour. They wouldn’t get off the road! Even though the giraffes are inside a high fence, they easily reach over to eat out of your hand. 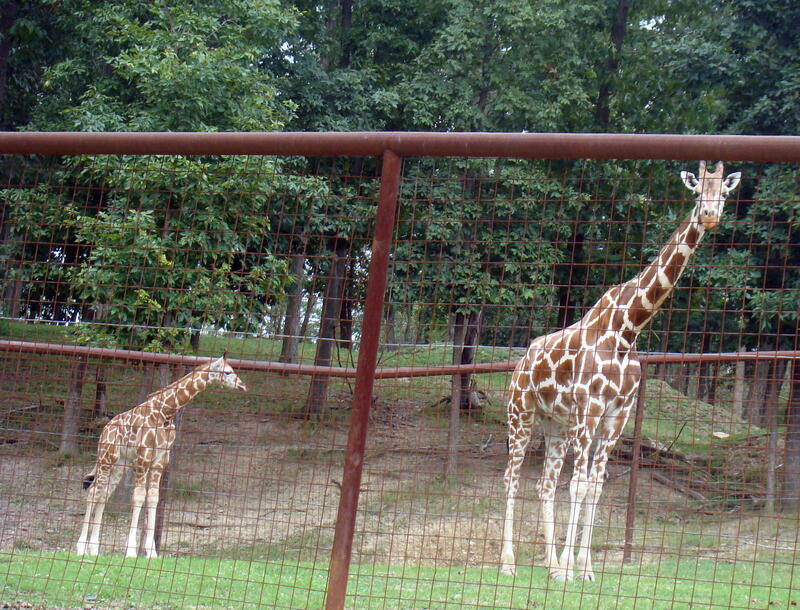 Here a special treat was mother giraffe, Liberty, and her five-day old calf, Luke. Big Bad John is always hungry. The Farm at Walnut Creek is truly where the deer and the antelope play, along with many other domestic and exotic animals. Feeding Big Bad John, a horned steer, requires caution, due to his long tongue reaching out for feed and his horns swinging from side to side. Everyone from child to adult enjoys feeding the animals and wishes the ride could last a little longer. At the end of this great family outing, spread out a picnic near the lake. 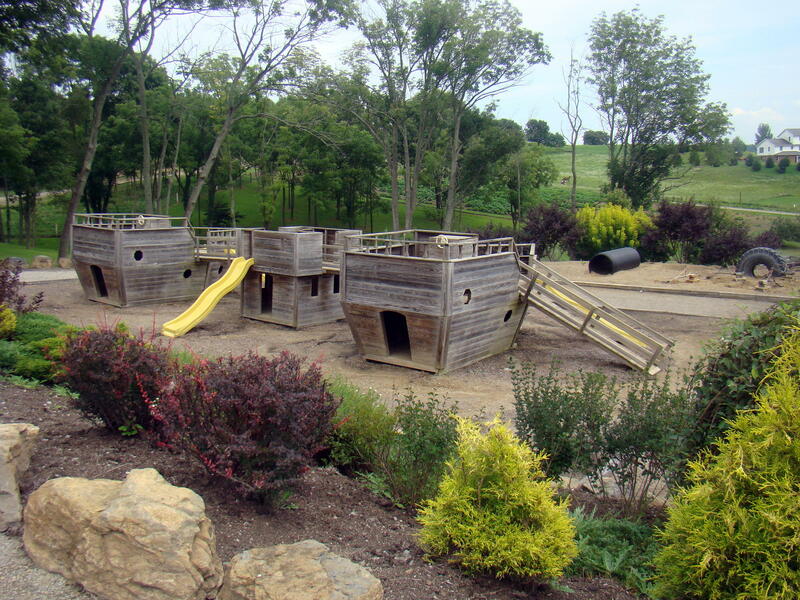 A Noah’s Ark playground seems the perfect play area for a day filled with animals. Take the plank up to the top of the ark, then come down one of several slides. Nearby is a sandy volleyball court. 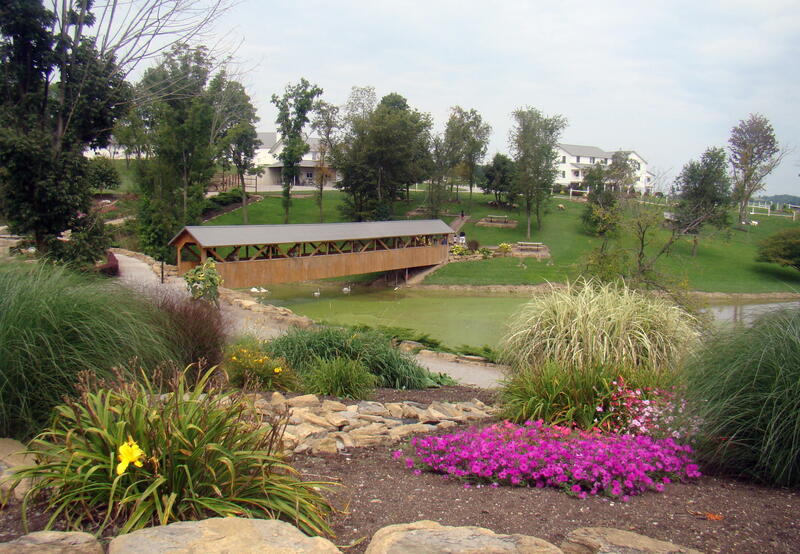 The Farm at Walnut Creek provides fun activities all year long. During the Fall Festival, you might try their famous pumpkin slingshot, or watch the Percherons press sorghum cane stalks into molasses. If you are lucky to have your winter trip fall on a day when the lanes are covered with a couple inches of snow, then you’ll be able to have a horse-drawn sleigh ride. The excitement continues all year long! The road to The Farm at Walnut Creek is a pleasant drive. Take I-77 to Exit 93, which will be SR 39. Turn left on SR 39 and go approximately 14 miles to a left turn on Co Hwy. 114. Signs are posted so watch carefully. Jackson Park near Byesville is a great place to walk on a winter day. Snow flakes fall against the window panes while the wind howls through the cracks in the wall. Looking out the window here in Ohio, there is snow as far as the eye can see. This is the perfect time to get out the picture album and reminisce about other snowy days. Dad bundles up to shovel snow. 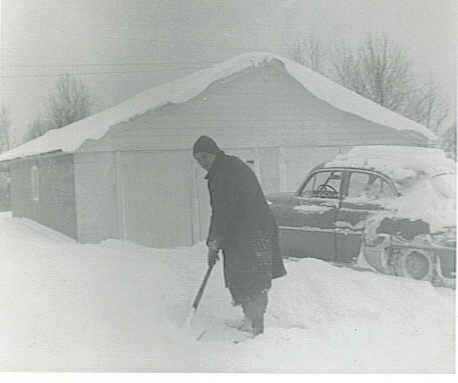 Shoveling snow has always been a winter chore throughout the years. Often this task got delegated to the man of the house as he bundled up in buckled boots, old overcoat, and toboggan to protect himself against the winter cold. At the time of this picture, the car wasn’t driven into the garage because the tires had chains on them to enable better traction in the snow. Sometimes it may have been days before anyone cleared the roads. It may be a neighbor with a blade on his tractor or perhaps the highway department, that finally opened the roads for needed supplies. Often when the snowplows cleared the roads, they would push a pile of snow a couple feet high across the end of your driveway. Or you may have lived in a place where the winds blew drifts several feet high. Those were and still are the times that try men’s souls and their backs. 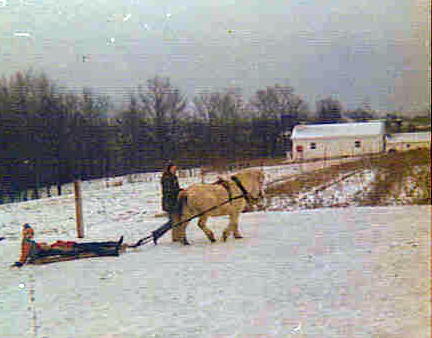 Children enjoy a sled ride. 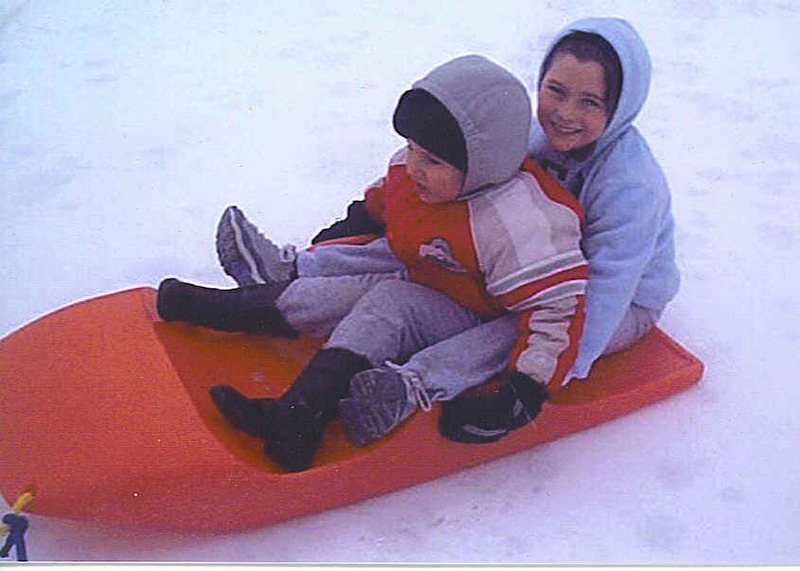 Children always enjoy a ride on their sled whether they are being pulled by someone or gliding down a hill. Many neighborhoods have a favorite hill where children gather to race on their sleds. Sometimes they may use a large lid or piece of cardboard with the front bent up so it can slide easily down the hills without getting caught in the snow. An old innertube also provides a great way to slide down a hill. You can be certain that everyone is going to come home covered with snow and ready for some hot chocolate. Carrot nose placed on his first snowman. 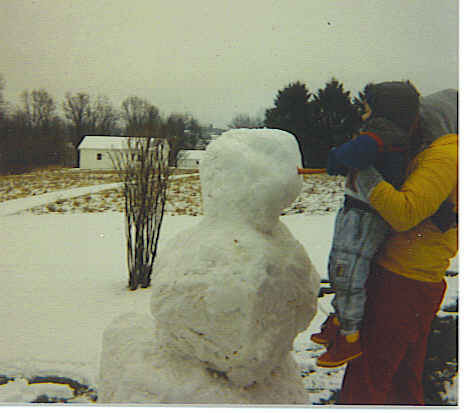 Another favorite activity in the wintertime is building a snowman. Parents enjoy helping youngsters build that first snowman as it makes dad and mom feel young again too. To add the finishing touches, a nose is created by using a carrot, while its mouth and two eyes are made out of coal. Many times a hat is placed on the snowman’s head with a scarf around their neck. Then everyone hopes it doesn’t melt away too quickly after all that hard work. Pepper, the Pony, pulls a sleigh over the snow. If you are lucky enough to have a horse of your own, or a kind neighbor with a horse, hooking up a sled or sleigh behind a horse is great fun. It is important that someone either lead the horse or ride it as otherwise the horse might take off too quickly leaving passengers on the ground in the snow. What a treat when it works properly! 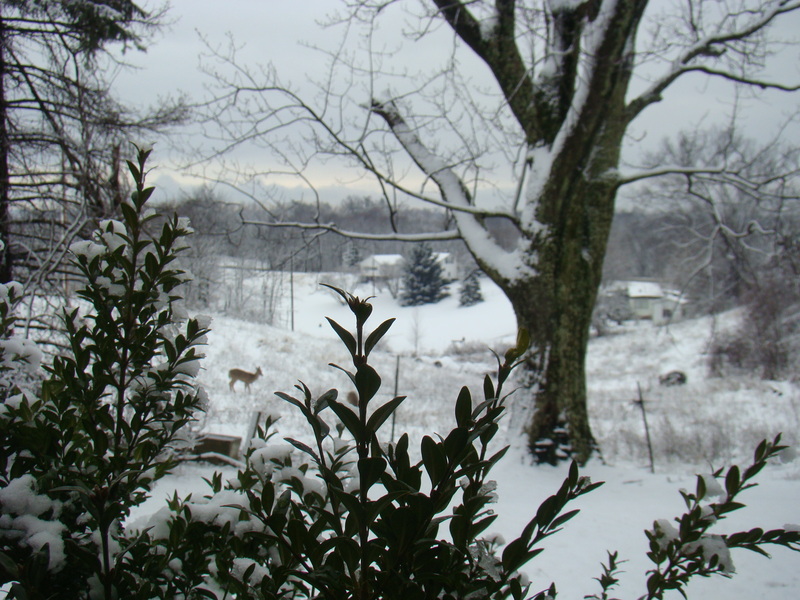 Deer wander over the Ohio hills, as seen from my kitchen window. This is also the time to see animals seemingly enjoying the snow as well. Kittens leap over snow covered chairs and playfully wrestle on the ground, while dogs might just sit and watch the activites around them. Deer graze on a few blades of grass still poking through the snow, while keeping alert to any danger around. 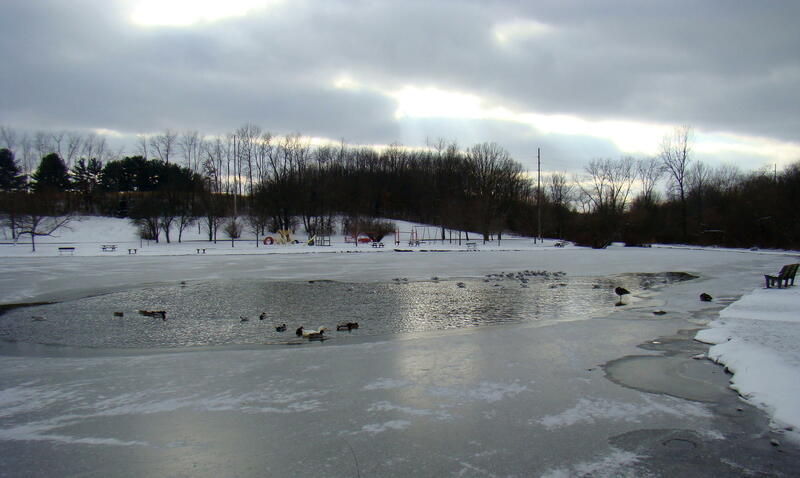 While this is not a favorite season for all, many truly enjoy taking a walk in the snow, skiing, or ice skating on a frozen farm pond. Winter recollections can be an enjoyable way to pass a homebound day. Wonder what your favorite wintertime activities might be? To tell the truth, this gypsy would rather take a road trip on a sunshiny day!